In the years since its founding in 1893, the South Carolina Society has sought to create interest in our colonial history through historic sites and objects, tangible connections to our past. The NSCDA-SC purchased The Powder Magazine (c. 1713) in 1902, thus saving the colonial structure from demolition. It was Charleston’s first building deliberately preserved and restored for its historical value. The NSCDA-SC operates The Powder Magazine as a museum with a variety of educational programs. The Society also owns the Stewart-Parker House (c. 1740) in Georgetown, a museum house currently leased by the City of Georgetown. 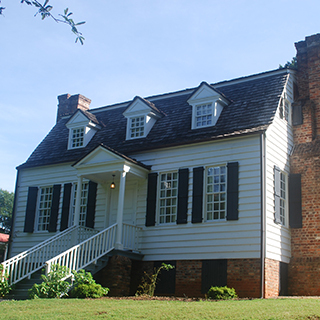 Located in Clemson and owned by the University, Hanover House (c. 1716) has been a long-term project of the Spartanburg Town Committee, while its current Tricentennial film project is being supported in part by the South Carolina Society. The Powder Magazine is the oldest public building in South Carolina and the only surviving structure from the original walled city of Charles Town. The 32-foot square building was completed by 1713 and housed some five tons of gunpowder to protect colonial Carolina from a variety of threats. Recognized for its exceptional value to the nation, The Powder Magazine was recognized as a National Historic Landmark in 1989. 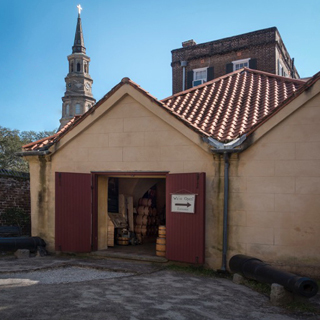 The building’s 300th anniversary was celebrated in 2013 with a new interpretive exhibit, Arsenal of History: The Powder Magazine of South Carolina. It focuses on colonial military history of South Carolina, offering a unique experience among heritage sites. Built between 1740 and 1770 by Robert Stewart, a planter and militia captain, the house is the only surviving brick residence in Georgetown built before the American Revolution. Overlooking the Sampit River, the handsome town house hosted President George Washington during his 1791 Southern Tour. It was gifted to the NSCDA-SC in 2006 and is leased by the City of Georgetown. Now operated in connection with the adjacent Kaminski House Museum in the city’s historic district, the Stewart-Parker House serves as a museum and event space. Completed in 1716 for Paul St. Julien, Hanover House originally stood in South Carolina’s Berkeley County. Designated as the most architecturally significant French Huguenot colonial structure in an area that was to be flooded in 1941, the house was taken apart and moved over 200 miles inland to the Clemson University campus. 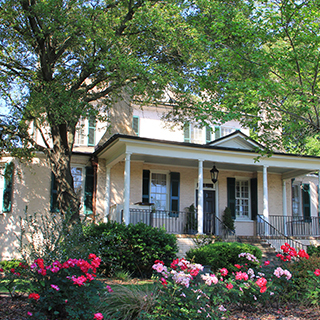 With many furnishings provided by the Spartanburg Town Committee of the NSCDA-SC, the house museum interprets the lifestyles of the Low Country. Listed on the National Register of Historic Properties, Hanover House is celebrating its Tricentennial in 2016. 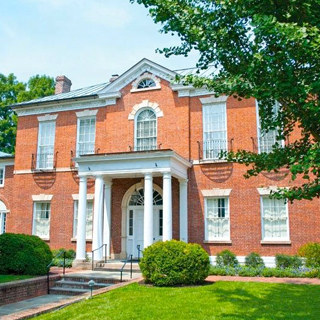 The National Society of The Colonial Dames of America was honored in 2000 by the National Trust for Historic Preservation “for acquiring, restoring, and interpreting a collection of historic properties that offer invaluable opportunities to experience the rich variety of America’s heritage.” The NSCDA is second only to the federal government in its number of historic properties. Dumbarton House, Gunston Hall, and Sulgrave Manor are the three NSCDA national properties supported by all 44 Corporate Societies. In addition, there are 41 diverse properties owned out-right by the state societies, 13 additional museum collections owned by the Dames, and 30 more properties receiving substantial volunteer and financial support from Dames. The NSCDA partners with the Garden Conservancy on “Open Garden Days,” recognizing their work in rescuing and maintaining gardens complements our historic preservation efforts. Dumbarton House, built in Washington, DC’s Georgetown neighborhood in 1799, is one of the country’s finest examples of Federal period architecture. Its collection includes furnishings, documents, and other artifacts that help tell the story of life in the new capital of a burgeoning American republic. Dumbarton House also serves as the NSCDA National Headquarters. 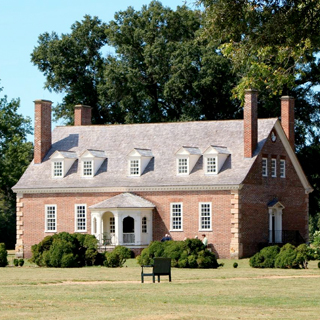 Gunston Hall, built circa 1755-59 in Lorton, Virginia, was the home of George Mason, founding father and principal author of the Virginia Declaration of Rights. Little changed since it was built, this colonial home contains more than fifty pieces owned by the Mason family and a large collection of other mid-to-late 18th-century furnishings. Sulgrave Manor is a superb Tudor house in Oxfordshire, England. It was built in the mid-1500s by Lawrence Washington, a direct ancestor of President George Washington. 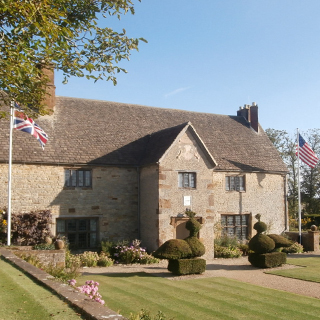 Sulgrave Manor was presented to the Peoples of Great Britain and the United States in 1914 and, within a decade, the NSCDA had raised $112,000 to endow this property in perpetuity.